An eye cancer starts in the eye. There are different types of eye cancers. To understand eye cancers, it helps to know something about the parts of the eye and what they do. 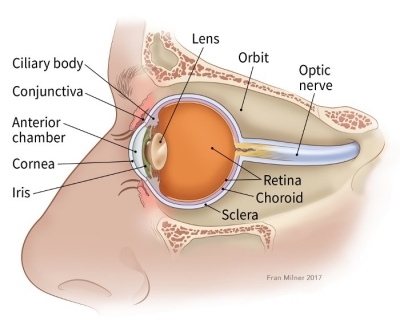 The eye has 3 major parts: the eyeball (globe), the orbit, and the adnexal structures. The main part of the eye is the eyeball (also known as the globe), which is mostly filled with a jelly-like material called vitreous humor. The eyeball has 3 main layers: the sclera, the uvea, and the retina. Sclera: The sclera is the tough, white covering over most of the outside of the eyeball. In the front of the eye it is continuous with the cornea, which is clear to let light through. The iris is the colored part of the eye (most often blue or brown). It surrounds the pupil, the small opening that lets light enter the eyeball. Retina: The retina is the inner layer of cells in the back of the eye. It is made up of specialized nerve cells that are sensitive to light. These light-sensing cells are connected to the brain by the optic nerve. When light enters the eye it passes through the lens, which focuses it on the retina. The pattern of light (image) appearing on the retina is sent through the optic nerve to an area of the brain called the visual cortex, allowing us to see. Cancers that affect the eyeball are called intraocular (within the eye) cancers. The orbit consists of the tissues surrounding the eyeball. These include muscles that move the eyeball in different directions and the nerves attached to the eye. Cancers of these tissues are called orbital cancers. Two types of cancers can be found in the eye. Primary intraocular cancers start inside the eyeball. In adults, melanoma is the most common primary intraocular cancer, followed by primary intraocular lymphoma. These 2 cancers are the focus of this document. Secondary intraocular cancers start somewhere else in the body and then spread to the eye. These are not truly “eye cancers,” but they are actually more common than primary intraocular cancers. The most common cancers that spread to the eye are breast and lung cancers. Most often these cancers spread to the part of the eyeball called the uvea. For more information on these types of cancers, see our documents on them. Intraocular melanoma is the most common type of cancer that develops within the eyeball in adults, but it is still fairly rare. Melanomas of the skin are much more common than intraocular melanomas. Melanomas develop from pigment-making cells called melanocytes. When melanoma develops in the eye, it is usually in the uvea, which is why these cancers are also called uveal melanomas. About 9 out of 10 intraocular melanomas develop in the choroid or ciliary body (which are parts of the uvea). Choroid cells make the same kind of pigment as melanocytes in the skin, so it’s not surprising that these cells sometimes form melanomas. Most of the other intraocular melanomas start in the iris (also part of the uvea). These are the easiest for a person (or their doctor) to see because they often start in a dark spot on the iris that has been present for many years and then begins to grow. These melanomas usually are fairly slow growing, and they rarely spread to other parts of the body. For these reasons, people with iris melanomas generally have a good prognosis (outlook). Intraocular melanomas are generally made up of 2 different kinds of cells. Spindle cells: These are long, thin cells. Epithelioid cells: These cells are almost round but with some straight edges. Most tumors have both kinds of cells. The outlook is better if the tumors are mostly spindle cells as opposed to mostly epithelioid cells. Epithelioid tumors are more likely to spread to distant parts of the body (such as the liver). If you have intraocular melanoma, your doctor can tell you which type of cells were found. Lymphoma is a type of cancer that starts in immune system cells called lymphocytes. Most lymphomas start in lymph nodes, which are bean-sized collections of immune system cells scattered throughout the body. Lymphomas can also start in internal organs such as the stomach, lungs, and rarely, in the eyes. There are 2 main types of lymphoma: Hodgkin disease and non-Hodgkin lymphoma. Primary intraocular lymphoma is a type of non-Hodgkin lymphoma. Most people with primary intraocular lymphoma are elderly or have immune system problems such as AIDS. Primary intraocular lymphoma is often seen along with lymphoma of the brain, known as primary central nervous system (CNS) lymphoma. Cancers of the orbit and adnexa develop from tissues such as muscle, nerve, and skin around the eyeball and are like their counterparts in other parts of the body. These are described in our other documents on cancers of muscle, nerve, skin, etc. For example, cancers of the eyelid are usually skin cancers, which are described in our documents on skin cancers ( Melanoma Skin Cancer and Skin Cancer: Basal and Squamous Cell). Muscle cancer is described in Rhabdomyosarcoma.